Severe drought in western states in recent years may be linked to climate warming trends, according to new research, led by scientists from the Lamont-Doherty Earth Observatory of The Earth Institute at Columbia University, to be published in the journal Science. This research was supported by the National Oceanic and Atmospheric Administration (NOAA) and the National Science Foundation (NSF). Analyzing aridity in the western U.S. over the past 1,200 years, the study team, which also included scientists from the University of Arizona, University of Arkansas, and NOAA, found evidence suggesting that elevated aridity in the U.S. West may be a natural response to climate warming. “The Western United States is so vulnerable to drought, we thought it was important to understand some of the long-term causes of drought in North America,” said lead author Dr. Edward R. Cook of the Lamont Doherty Earth Observatory’s Tree Ring Laboratory. The study revealed that a 400-year-long period of elevated aridity and epic drought occurred in what is now the western U.S. during the period A.D. 900-1300. This corresponds broadly to the so-called “Medieval Warm Period,” a time in which a variety of paleoclimate records indicate unusual warmth over much of the Northern Hemisphere. The authors of the new study argue that there are climate mechanisms involved that make warming climate conditions likely to lead to increased prevalence of drought in the western interior region of North America. Looking at implications for the future, the authors express concern. “Any trend towards warmer temperatures in the future could lead to a serious long-term increase in aridity over Western North America,” they write in the paper. Co-author Dr. David Meko of the University of Arizona tree ring lab notes that the drought that has gripped the western United States for the past four years “pales in comparison with some of the earlier droughts we see from the tree-ring record. 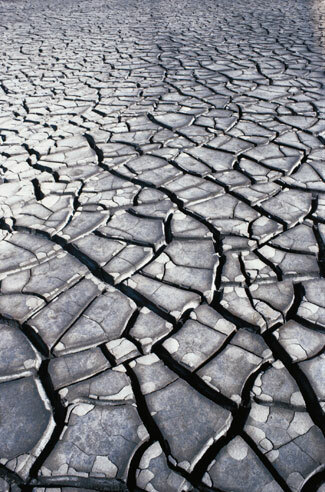 What would really put a stress on society is decade-long drought." “If warming over the tropical Pacific Ocean promotes drought over the western U.S., this is a potential problem for the future in a world that is increasingly subjected to greenhouse warming,” Dr. Cook added. The study’s authors used tree ring records to reconstruct evidence of drought, and also looked at a number of independent drought indicators ranging from elevated charcoal in lake sediments to sand dune activation records. The team then used published climate model studies to explore mechanisms that link warming with aridity in the western U.S. In addition to the paper in Science, they also used the data to create a CD-ROM called the North American Drought Atlas, the first of its kind, providing a history of drought on this continent. The atlas contains annual maps of reconstructed droughts over North America, an animation of those maps showing aridity over time, and a time series plot of each reconstruction with associated plots of calibrated and verification statistics. The North American Drought Atlas CD-ROM can viewed at http://www.ngdc.noaa.gov/paleo/pdsiyear.html. The Lamont Doherty Earth Observatory is part of the Earth Institute at Columbia University, the world’s leading academic center for the integrated study of Earth, its environment, and society. The Earth Institute builds upon excellence in the core disciplines–earth sciences, biological sciences, engineering sciences, social sciences and health sciences–and stresses cross-disciplinary approaches to complex problems. Through its research, training and global partnerships, it mobilizes science and technology to advance sustainable development, while placing special emphasis on the needs of the world’s poor. For more information please visit www.earth.columbia.edu. The Earth Institute at Columbia University is the world’s leading academic center for the integrated study of Earth, its environment and society. The Earth Institute builds upon excellence in the core disciplines—earth sciences, biological sciences, engineering sciences, social sciences and health sciences—and stresses cross-disciplinary approaches to complex problems. Through research, training and global partnerships, it mobilizes science and technology to advance sustainable development, while placing special emphasis on the needs of the world’s poor.